Jo Eades: Weekend Catch Up! Can't believe it's nearly the end of June already. Where has the time gone?????? Here's a couple of cards I've made over the last few weeks. We had some good, natural light coming in the window this morning so I thought I'd take advantage of it with these photos - the only thing is - I think I like the ones I take at night using the daylight globe and dare I say it, the flash, better! 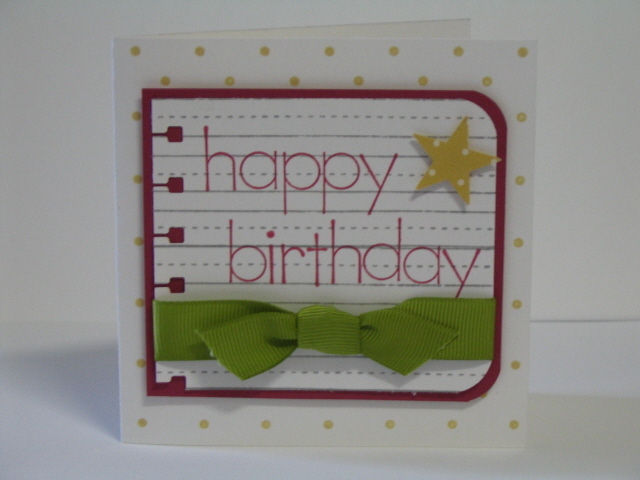 This is a baby card I made a few weeks ago for my ''for sale' box. Colours are So Saffron, Bashful Blue and Night of Navy with a bit of Whisper White thrown in. Layout was based on one in the May 2007 edition of Cards Magazine. 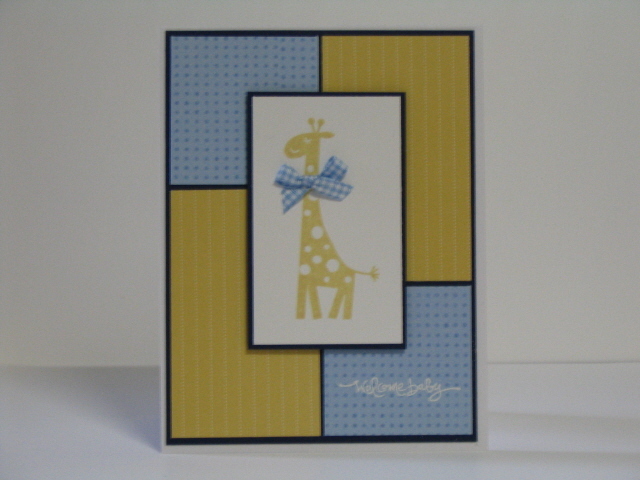 Giraffe is from Wild About You, sentiment is from Short & Sweet (both by Stampin' Up!) and the polka dots are from Art Warehouse (Memories Interactive Journalling Backgrounds). Patterned paper is So Saffron Designer Series Prints (no longer available). 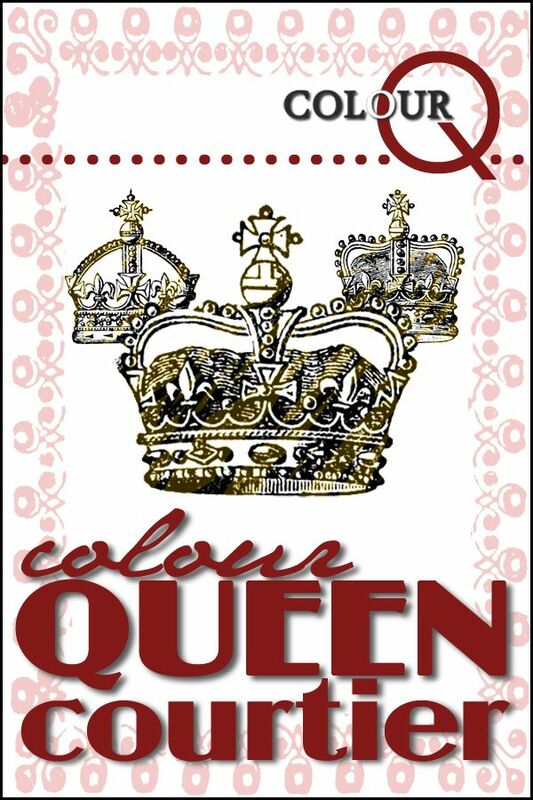 The following cards were going to be last week's submissions to Kristina's Colour Inspiration #11. I didn't submit any of them, you'll see why. This next one I really like but after spending at least 3 hours on it last Saturday night and it STILL not working using all the required colours, I cracked it and went to bed. Since I had well and truely missed the deadline for submission by the time I got to sit back down again, I just decided to leave out the colours that weren't working. I'm also ashamed to say that this card was the first time that I used my Green Thumb set by Papertrey Ink which I got over a year ago. To get the colour variation, I just kept stamping using Rose Red ink without reinking in between. It's hard to see but there is also a little 'bling' in the center of each flower and on either side of the Happy Birthday sentiment that was supposed to be embossed with White EP instead of the Clear I inadvertently picked up and (sprinkled on before noticing, doh). Sentiment is from It's Your Birthday by SU! 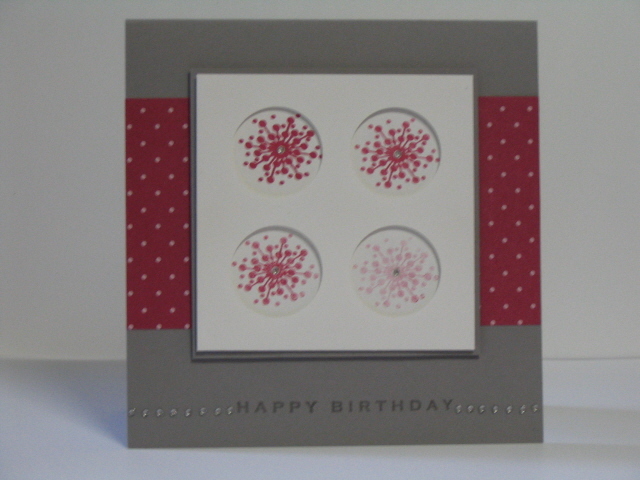 and the patterned paper is Rose Red from Designer Series Paper pad. 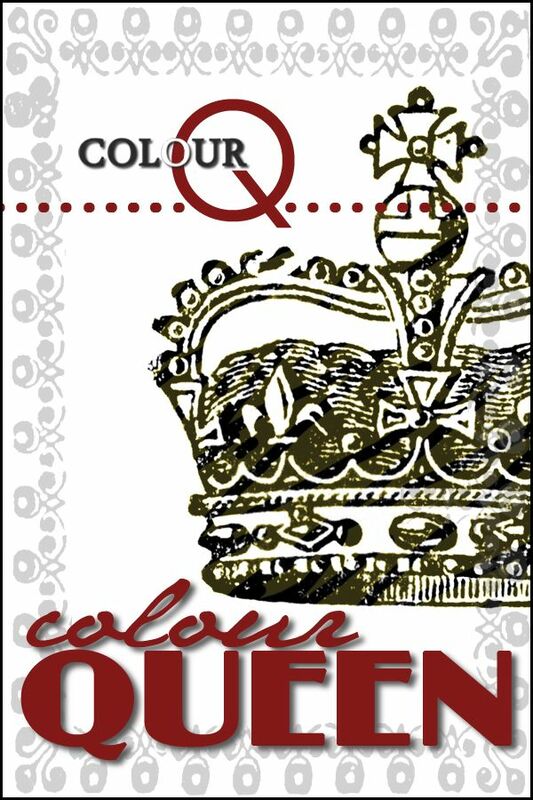 The last one uses one of the many Saffron/White Polka dot bases that I made for the colour challenge. 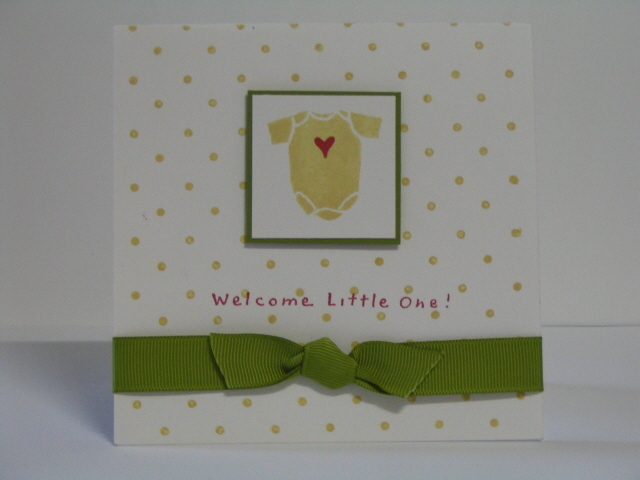 The onesie image is from Savvy Stamps, the sentiment is from Stampa Rosa and the little heart is from Small Sayings (SU! & retired). At first, I thought I'd met the colour requirements but then I realised I hadn't used any Going Grey. Again, way too late for it to matter and at least it was good to dust off some of my pre SU! stamps that haven't seen the light of day for quite while. Ooooh, I love every one of these cards! I really need to use my polka dot background more often.